PHUKET: Chalong Police yesterday arrested a man who was wanted on arrested warrants issued in Trang province for theft in May and September last year. The man had subsequently escaped from his home province and taken up monkhood at Big Buddha. At about midday yesterday (Jan 3), Chalong Police led by Lt Col Pongpop Prasoppichai together with officers from Na Yong Police in Trang led by Lt Col Kamron Tongsaner arrested Phra Warawit or Warawit Satjabut, 31, from Trang at a monk house at Phuket’s iconic Big Buddha or Wat Phraputtamingmongkol Eaknakakeeree located in the Nakkerd Hills between Chalong and Kata. The arrest of Warawit came after Trang Provincial Court issued two arrest warrants against him last year. The first was issued for a night time robbery on May 29 while the other was issued for vehicle thief on September 26. 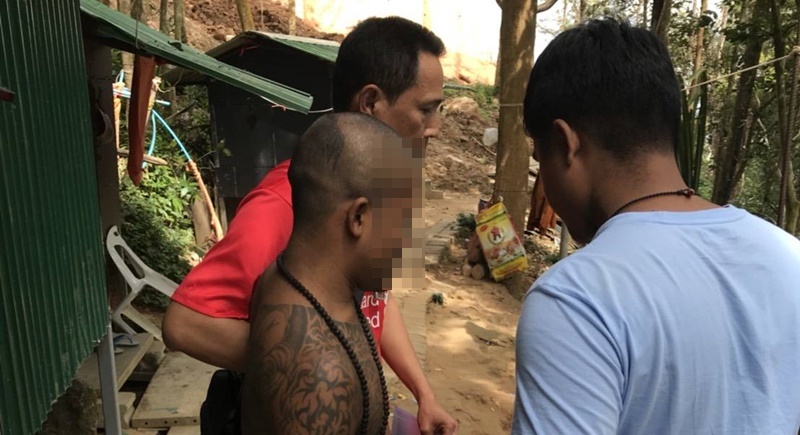 During their investigation,officers from Na Yong Police discovered that Warawit had escaped to Phuket and had taken up monkhood at Big Buddha. Warawit admitted that he was the person named in the arrest warrants. After being defroked by the temple, Warawit was taken to Chalong Police Station from where he was later transferred to Na Yong Police to face legal action. Seems taking up monkhood is very easy to do in Thailand when you like to hide for the Law. Remember that yellow shirt tv station owner in Bangkok. He did the same for a period of 1 year until all was cooled down. Before getting robed as monk, are there no checks on the person,  back round, criminal records, etc. ?